T.I.M.E Stories is a time-traveling decksploration game created by Peggy Chassenet and Manuel Rozoy and published by Space Cowboys. Agents from the T.I.M.E Agency are sent on missions to different places in time and are given the chance to take on the roles of different T.I.M.E Stories characters from those eras. Complete the mission in time or you will be recalled to the agency, where you will have to start your mission over again. T.I.M.E Stories expansions give players the chance to go on unique missions. You will get one mission, Asylum, in the base game box. Each deck of cards in T.I.M.E Stories determines where your mission takes place. The initial 120-card deck included with the game is Asylum, set in a 1920s French insane asylum. Players start at their home base in the Agency where they are briefed on their mission. The players explore their environment through the deck of cards, which details their environment, characters they run into, and developments in the story through panoramic pictures. Some cards are unlocked only when a player has a specific item, and a set of action dice is used to determine the outcome of altercations, or tests. Each T.I.M.E Stories mission has a specified number of time units that the players must use to move around the environment. Once these units are used up, the agents are recalled to base, whether they have completed their mission or not. The game looks more complicated than it actually is. Essentially you are moving your T.I.M.E Stories characters to different areas, looking at cards, and reacting to those cards. It is very story-driven, so if you are able to get into mission’s story and role-play your characters, this game will probably be a hit with your group. One of the coolest things about T.I.M.E Stories is how it incorporates cooperation. When a player gets to read the back of a card, they have to explain what they’ve just read to their teammates rather than just reading it verbatim. This forces the group to work together to figure out how to advance in the mission, which is just awesome. It’s something that you need to experience to fully understand. We think that the artwork alone would make T.I.M.E Stories a worthy purchase for any cooperative board game fan. It was nominated for the Golden Geek Award for Best Artwork/Presentation, and rightfully so. Whenever we were first flipping over new locations, we could not wait to see the artwork on each of the cards. We still think that Robinson Crusoe is the most thematic co-op game around, but T.I.M.E Stories might just be our #2. Story-driven games aren’t for everyone, but the people in our group were easily able to get into Asylum thanks to the amazing artwork and the well-written text on the cards. The T.I.M.E Stories base game has very little replay value since you are pretty much done with the game once you have completed the scenario that comes in the box. You could repeat the mission, but knowing what’s coming takes away some of the joy and tension that was there during the initial runthrough. More T.I.M.E Stories missions can be purchased, though, so anyone who falls in love with the game will have the option to get many more hours of enjoyment out of it. T.I.M.E Stories is a very well-designed and conceptualized game that would be very enjoyable for anyone looking for a thematic, story-driven cooperative game. It is actually one if our group’s favorite co-op games, and we can see why so many people look forward to seeing the new stories and artwork that come with each new expansion. 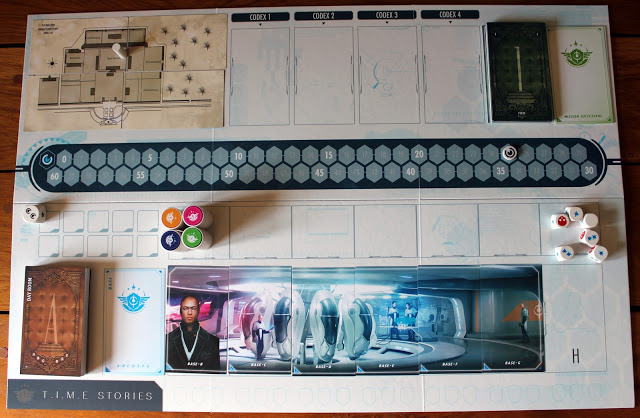 Thanks for taking the time to read our T.I.M.E Stories board game review!